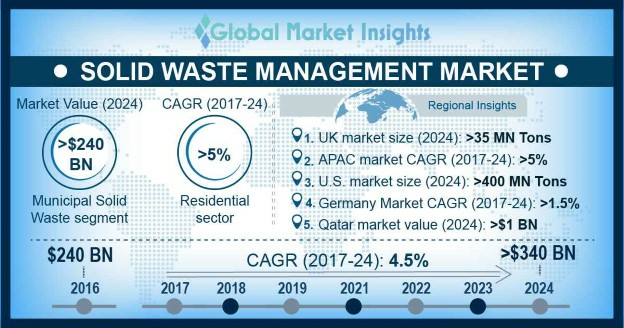 Global Solid Waste Management Market size was valued at over USD 240 billion in 2016 and the annual capacity is set to exceed 4.5 billion tons by 2024. Government measures to reduce illegal dumping coupled with the introduction of sustainable mechanism to manage waste will drive the global solid waste management market size. Growing adoption of WTE incineration and recycling techniques will further stimulate the business growth. The EPA has introduced Resource Conservation and Recovery Act (RCRA), with an aim to reduce open dumping and to manage hazardous and nonhazardous waste. Inevitable rise in non-hazardous waste owing to rapid economic growth primarily across developing nations will foster the solid waste management market share. Significant growth in population along with increasing urbanization will boost the demand for management services. Rising focus towards sustainable power generation from left-over materials will further embellish the industry growth. As per the UNESCAP, the ASEAN region in the past five years has witnessed an annual urban population growth rate of 2.6%. Introduction of government norms and regulations to curb greenhouse gas emissions will augment the market growth. Adoption of recycling and prevention techniques to cater the increasing waste will further augment the industry landscape. The Climate Change Act of 2008 aims to reduce UK’s GHG emissions by 80% by 2050. Municipal solid waste management market is predicted to exceed USD 240 billion by 2024. Rising public awareness coupled with favorable government initiatives toward environment protection will augment the industry landscape. In Japan, the Waste Management and Public Cleansing Law aims to minimize generation and ensure proper segregation, storage, transportation, collection, disposal, and recycling for environmental preservation and public health improvement. 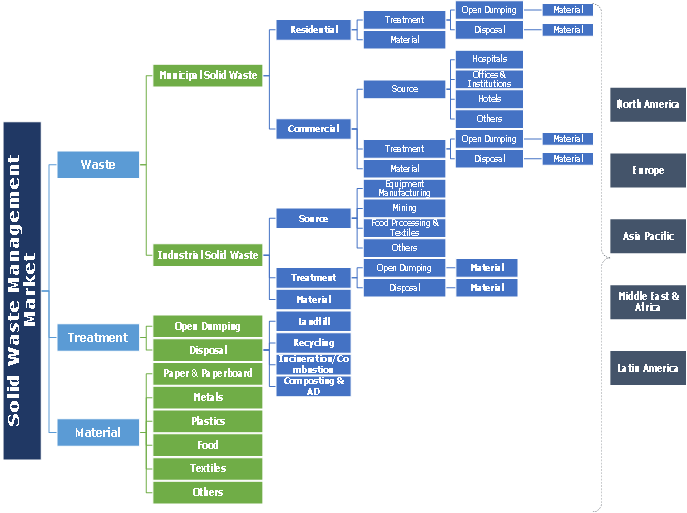 Industrial solid waste management market share will witness strong growth owing to increasing volume of left-overs from manufacturing and packaging practices. As per Eurostat, in 2016, EU-28 accounted for 1.4% growth in industrial production as compared to 2015. Collection accounts for 29% of the global solid waste management market share. Shift towards privatizing collection services along with favorable government incentives including tariff exemptions and soft loans will enhance the industry growth. Remodeling of management services from traditional collection technologies to advance disposal and treatment services will further augment the business growth. The National Industrial Policy (No. 28/2008) of Indonesia aims at adopting mechanisms such as tariff exemptions, soft loans and grants for the acquisition of waste treatment & pollution control equipment. Disposal solid waste management market will grow on account of norms toward the reduction of landfills. Ongoing regulatory measures including the municipal landfill diversion program along with collection of recyclable materials will eventually boost the demand. The Land Disposal Program Flexibility Act of 1996 (LDPFA) directed the EPA Administrator facilitate additional flexibility for any landfill that receives 20 tons or less MSW per day. Residential solid waste management market is set to witness gain over 5%. Expansion of residential establishments owing to rising population and robust economic growth will augment the industry landscape. In 2017, the U.S. residential construction industry generated a revenue of USD 500 billion as compared to USD 460 billion in 2016. Industrial market will grow on account of increasing dumping from manufacturing and construction sites, fabrication industries, chemical laboratories and power plants. As per office for national statistics, in August 2017 construction output in the UK grew by 0.6% on monthly basis. The U.S. solid waste management industry is projected to witness strong growth owing to enforcement of strict laws against landfill and waste handling. Paradigm shift from traditional collect and dump models to innovative solutions to sustain effective management will fuel the industry growth. In 2014, the U.S. industrial waste generation across energy sector accounted for 18% of overall share. Asia Pacific market is predicted to witness growth over 5% by 2024. Increasing establishments of manufacturing facilities subject to cheap labor and ample raw material availability will augment the industry landscape. Internal migration of rural population towards urban areas coupled with deterioration of environment to support industrial development will further embellish the business growth. As per United Nations Industrial Development Organization, in 2016, manufacturing output across Asian economies grew by 6.5%. Key industry players include Biffa Group, Green Conversions, Amec Foster Wheeler, Xcel Energy, Recology, Hitachi Zosen, Covanta, Keppel Segher, Plasco Conversions, Wheelabrator Technologies, Nexans, China Everbright International, Cleanaway, Sims Metal Management, Stericycle, Veolia, and C&G. Major players across industry are focusing on new product developments along with M&A’s to gain competitive advantage. In September 2015, Veolia acquired AKG Kunstof Groep to strengthen its position in the recycled raw materials market. The acquisition will aid the company to better serve the customer’s requirements by gaining expertise in the circular economy sector and the latest technology. The operation includes collection, treatment and disposal to convert it into valuable source. Growing urban population across several developing countries will raise the revenue from municipal areas over the coming years. Primary function comprises of disposal techniques including landfills, recycling, WTE incineration and composting & anaerobic digestion. Government has introduced various measures and incentives to limit open dumping and reduce air pollution.